The last day of a recession is the best day to start a business, the saying goes. So tackle the 10 steps in this guide now - and be ready to ride the rebound when it comes. If your career to date has been spent inside organizational flow charts with more layers than baklava, starting your own shop is bound to be an adjustment. 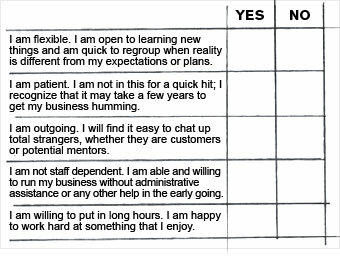 Fill out this checklist to see if you're cut out to be your own boss. If you have a nearly straight line through "yes," great. If not, you may want to make peace with being a cog in someone else's wheel.